RootsRated asked Beth Lopez about her running ambitions, what she finds challenging about the sport and what her future goals are. You can readBeth's profile here. What is it that interested you in running? I think at the very beginning, it was just a simple way of getting in a workout and burning a lot of calories in a short period of time. I’ve always been really health conscious. Working out is important to me, and I pay attention (I’m a little bit neurotic) to what I eat, what I burn, and keeping up a really high fitness level, mostly for skiing, because I get really in shape for ski season, and then in the summer I hike around. But I lose a little bit of that muscle definition and then try to ramp up again for the next season. 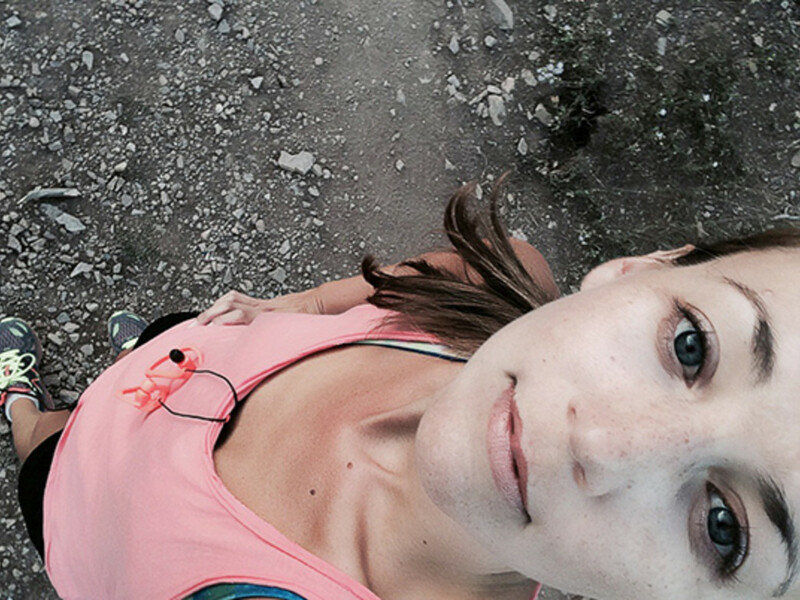 But as soon as I grew to love running, which didn’t take very long, it became something completely different. It gives me time to think. Running is a perfect time to catch up with a friend and finish it off with brunch. It’s almost like instead of burning calories (I guess I’m still doing that), I’m burning angst. When you’re doing a sport like running, you really have to be in the moment. It forces you to or you can get really hurt. So I like being forced to be present. Do you enjoy running alone or in a group and why? It depends on what my need is. I love both running alone and in a group. If I’m in ‘herder’ mode and taking out some of my co-workers who have never really gotten out running, I get really excited about sharing that. And the social aspect of it is extremely fulfilling. But I do love that quiet moment when no one’s asking anything, and I can just look at the dirt and look at the view around me and just go. Music is really important. That helps me keep my pace up and zone out. I make a new running playlist every spring and summer. What is your biggest challenge in running and what do you do to manage this challenge? I think my biggest challenge is feeling like I don’t have a really fast natural pace. Some people can just naturally go fast for longer periods of time especially guys that I run with as well as women I run with too. That gets really frustrating, because I’m competitive and I like to be good at whatever I do. If I get burned by someone on the trail and they just go flying by, I get so anxious. Even if they’re a total stranger, I always pick up my pace and sometimes I do it to my own detriment. I actually try to keep up a pace that I’m not ready to keep up and really fry myself and burn out before the end of the run. I’ve been talking to some friends that have that natural advantage and my friend Pete is really great, because he’s a much more experienced runner than I am, and he has been trying to coach me on some more speed, short distance/faster paced kind of workouts for interspersing little sprints into longer and slower paced runs. Or doing heart rate training where the only goal is to just keep your heart rate at ‘x’ amount and not really shoot for any other number. If you do that long enough then your heart just naturally gets conditioned to handle a faster pace better. How does running benefit you personally? What is your favorite season to run in and why? My favorite season to run in is fall. I love it; the crispness in the air. In the spring you’re craving more, and in the fall you’re recovering from an excess of it. It feels so refreshing just to get a cool breeze going. Especially when you’re trail running, the breeze is so crisp. Everything just lights up. You just feel much more alive. What would be your ultimate achievement in running? I think my ultimate achievement in running, or my biggest goal is to shave down my time. I’d love to do a half in 1:40 or in 1:30.That would be so nice, because so far I haven’t been able to break 1:50, and I know I could do better. That’s like trying moderately hard, and I think ‘no I have to be able to throw myself into it’. So I’m trying to get more disciplined about really incorporating speed training. It’s been kind of hard doing that for my first race coming back from my injury, but that’s in the plan, also getting comfortable with longer distances. I would love for a marathon to not be the end of the world. Or I’d love to be able to do an ultra, like a 50-miler or even more, because it’s completely possible, and I’m really inspired by runners who do that. Scott Jurek, talk about vegetarian/vegan lifestyle and managing these huge ultra-distances and overcoming injury. I’ve read anything he ever writes, because I find it super inspiring. If I can get to the point where I can run faster and longer, and it doesn’t kill me, and I actually stay in that endorphin running zone, that would be great.